DHL, the world’s leading logistics company, and SOS Children’s Villages, an independent, non-government child welfare organization, have partnered the United Nations Educational, Scientific and Cultural Organization (UNESCO), and Madagascar’s Ministry of Education to launch two new Olympiads aimed at raising the country’s skills in science, mathematics, and innovation. The Olympiads are initiated as part of the GoTeach program, the corporate responsibility initiative run by DHL and non-profit organization SOS Children’s Villages that has improved youth education and vocational skills in developing regions worldwide. One Olympiad will test secondary students’ mathematics and physics skills, while the other will require participants to create an innovative design or product using recyclables, emerging technologies, or “fablab” materials typically employed in small-scale digital production. DHL expects more than 1,500 young Madagascans to compete in the Olympiads, for a range of prizes including PCs, tablets — and the chance to have their innovation funded to completion by DHL. 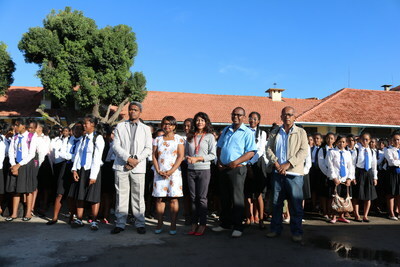 The launch comes as UNESCO and Madagascar’s Ministry of Education acknowledge the team’s work over the past eight years with formal awards for five of the initiative’s key leaders (see Notes to Editors). Since commencing worldwide in 2011, the DHL-SOS Children’s Villages partnership has engaged with up to 450 young Malagasy every year through a range of mentoring programs, job forums, and vocational training seminars. To date, 36 Malagasy youths have received internships with DHL, with 20 of them translating into full-time employment opportunities with the company. “One early participant in our mentoring program went on to complete an internship in DHL’s IT department, which gave her valuable IT knowledge that has helped gain the trust of her employer, who now gives her responsibility over the company’s website,” said Mamy Rakotondraibe, CEO of DHL International Madagascar. “So far, we’ve seen our mentees successfully enter all manner of professions from legal assistants to pastry chefs, using the skills that they learned and practiced during their time with us to create a hope and future for themselves and their families. This event is open to all private/ public secondary and high schools in Antananarivo, Antsirabe and Toamasina. Students are required to answer general Mathematics and Physics questions in two rounds of tests — the first will be held on 11 March 2017 and the second will be held on 1 April 2017. The finals will be held in Antananarivo on 27 or 28 April. This event is open only to youths from SOS Children’s Villages in Antananarivo, Antsirabe and Toamasina. Participants must come up with an innovative project using “fablab” materials, recyclables or new technologies. Submitted projects will be displayed to the public during the finals on 27 or 28 April at Antananarivo and the winning project will receive funding from DHL to realize the project.